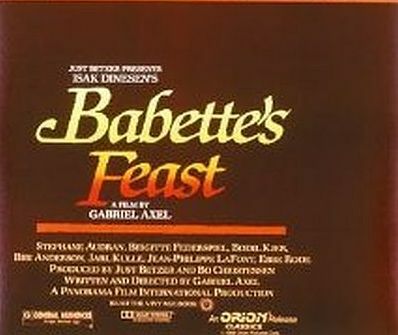 I have seen Babette's Feast at least four times, once in the theater when it first came out, back in 1987, and three times on TV or on videotape. Last weekend I saw it for the fourth time with 3 people who had never seen it, and as I watched it this last time, I believe I was able to get a new understanding of it that had escaped me before. What most reviewers of this magnificent film don't see is that beneath the immediate story of two Danish sisters and their French maid, this is a film of Christian sin and Christian redemption. In a small village in Danish Jutland, there lives a minister with his two young daughters. The minister's flock look upon him as a saint. In fact, they call him a prophet. The daughters are quite beautiful and have many suitors in the town. But the minister is very possessive and does not want his daughters to leave him. He tells one suitor, "My daughters are my left and right hands. Why would you deprive me of them?" Enter two men from Paris who come to the town and each fall in love with one of the daughters. One a young army captain and the other a music and voice instructor. The daughters do not even have to consult their father. They look at his face and see his displeasure at the attention the two men are giving them, and they send the two men away. The true character of the father-minister is revealed when the music teacher is sent away. Seeing his heart broken, the minister responds by laughing in a mean-spirited way. Time passes and the minister dies. The daughters are now middle aged spinsters. Suddenly a French woman, Babette, a refugee from social and political unrest that is occurring in Paris, arrives in the town. She meets the minister's daughters and takes up residence with them. Explaining that she has no money, she agrees to become their cook in exchange for room and board. Fourteen years pass and Babette learns that she has won the French national lottery. 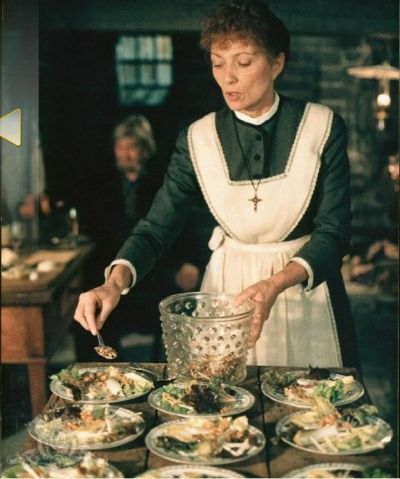 She plans to return to France but tells the sisters that she wishes to thank them for their kindness to her by preparing a French dinner for the church members which she will pay for out of the money she has just won. The sisters protest but Babette insists. The finest delicacies begin to arrive in the Jutland town as preparations for the meal are made. The church members help in the preparation of the meal and it is now that we see how the minister's meanness has affected them. The so-called "prophet" has instilled in them a nastiness and pettiness that is manifested by gossip and backbiting and insulting each other while the dinner is being prepared. The sisters see this behavior but say nothing. They have been raised to not complain or confront people, and to say anything about the parishoners' bad behavior would be a negative reflection on their father's spiritual leadership. The evening of the dinner arrives. The church members appear. But Babette has also invited a friend, an upper class elderly French woman who is traveling through Denmark with her nephew. As it turns out, the nephew is the young captain who once wooed one of the sisters. He is now a mature and successful general in the French army. The guests are seated and the meal begins. Babette does not appear at the table. She remains in the kitchen throughout, supervising the serving of the meal. The finest wines are served and Babette instructs the young man assisting her to make sure that the general's glass is never empty. The guests dine on the exquisitely prepared meal and as they eat and drink, they become mellow and they realize how generous and loving Babette has been to them in making the meal. As they become relaxed and a bit intoxicated, they begin to reflect on their nasty behavior to each other. As the minutes pass, they begin to confess their sins against each other and to ask forgiveness. The general is feeling very expansive. He rises and makes a speech. He says, "In my life I have raised my sword many times in defense of women's honor. But now there is only one woman for whom I would raise my sword in defense of her honor. That is the woman who was the chief cook at my favorite restaurant, Cafe Anglais." The meal is concluded and the guests walk out under the late night starry sky where they dance and bless each other before taking their leave. They are sated and cleansed of their sins against each other. 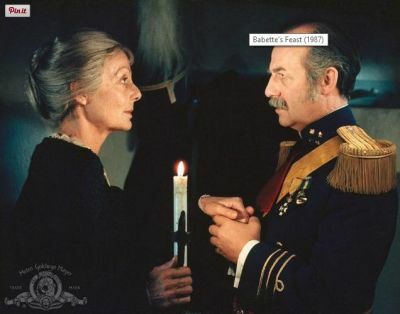 Before he leaves, the general speaks to the daughter whom he once wooed. He tells her that he has never stopped loving her and now he vows himself to be faithful to her for the rest of his life. No, his love for her will not be physical but he in France will love her in Denmark, and from a distance it will be a pure and unselfish love. 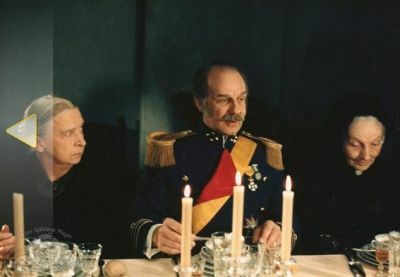 The general and the rest of the guests take their leave and Babette comes out to join the sisters. They express gratitude and affection to her and ask her when she will be leaving for France. She replies that she cannot return to France because she has no money. She has spent all of her lottery winnings on the dinner. And besides, she adds, she has nothing to go back to. Everyone she knew is now gone. She asks to remain with the sisters as their cook and of course they are happy to have her stay. Babette says to them, "Do you know that once I was the chief cook at the Cafe Anglais?" The sisters embrace her and say to her, "Babette, when this life is over, you shall be chief cook in paradise and you shall prepare a great feast there, and the angels will love you."